The Morimoto XB replacement HID bulbs are built to industry-standard specifications and meet/exceed all SAE, DOT, and ECE requirements, making them a perfect match for a replacement bulb or upgrade! They have been tested for reliability with all ballasts and passed with ease. 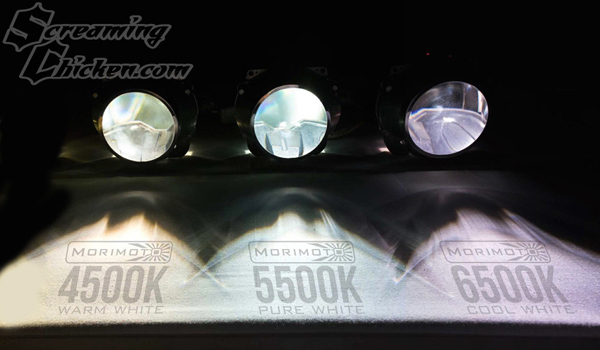 When it comes to HID bulbs, Morimoto has always brought us the best in the aftermarket, and their latest examples are no exception. These bulbs replace your factory HID bulbs only, will not work if you do not have GM HID headlights. Factory GM bulbs are similar to a 4500K bulb in the comparison pictures, also available as a 5500k or 6500k bulb also. They are guaranteed for 2 years of trouble free service. Price listed includes a pair of bulbs. Fits all 2016-18 Camaro RS, SS or ZL1 with HID headlights.